In the past weeks we have explored dive sites that may have turtles, while on other occasions we have searched for clownfish and lionfish. Today we are going to look for the excitement of WALL DIVING. Here we will explore some dive sites that enable you to go "Over the Edge" and glide down into the cobalt blue waters surrounding our wonderful island home. So over the side and here we go. Walls of vertical limestone exist in several dive sites around the main island of Okinawa. From Onna to Bolo Point we are fortunate enough to have land formations underwater that thrust sheer cliffs of excitement upward almost to the surface. Let's explore some sites that have a beach access and are easiest for shore divers to play on. Onna Point at Horseshoe Beach (See Japan Update Oct 26th, 2000 Issue). This dive site has a vertical wall that may be the most dramatic on the island and is always my first choice when the water has flattened out and is perfectly calm. Here the wall is absolutely vertical but what I like most is that you can descend to 15 feet and slowly make your way to the edge so that you can carefully prepare for your flight over the edge. This wall can descend beyond our recreational training of 130 feet so you will definitely want to monitor your depth gauge often. Sea fans are beginning sprout back out from the walls and you will see numerous extensions of wire coral unwinding their way into the ever nourishing currents that bath the wall everyday. Please be careful here and don't scrap across this new growth but help preserve it for divers behind you to enjoy too. I like descending to about 60 feet and then heading into the light current for the first half of my dive. This allows me to coast back to my descent point when it is time to return to shore. Lionfish and sea fans abound in this area but the real thrill is having so much blue water everywhere. Adjusting your buoyancy so that you are weightless gives you the feeling what it must be like for astronauts that get the chance to space walk. So I guess this is an "Inner-Space walk" of sorts. Moving south from Onna Point's Horseshoe beach the next wall dive I suggest is on the left side of Bolo Point at Zanpa Misaki. (Refer to Japan Update August 10th, 2000 Issue) This area, much maligned for the number of aquatic injuries and deaths, should never be dove unless the water is as flat as a swimming pool. But when it is flat this is an awesome wall dive. The walls here on the left side of the "Point" are the equals of Onna but here you will find more sea life. There are two large Yellow Marginal Moray Eels, about five large lionfish that enjoy hunting on the vertical walls and inside the numerous nooks and crannies formed by the huge boulders of limestone that lean up against the wall, and then of course near the base of the wall is a small, but very popular family of white tip reef sharks that have added excitement to a countless number of divers unprepared for their appearance. For more timid divers (like me) you will be amazed at the number of colorful nudibranchs that call the walls of Bolo Point home. These are those colorful little "slugs" of the ocean that are about the size of your smallest finger and really challenge macro photographers on every dive. For details about the "slugs" of Okinawa click over to Dr Bolland's web site at Oki Slugs This site will certainly educate you about the macro wonders you may be swimming past while enjoying this awesome wall. 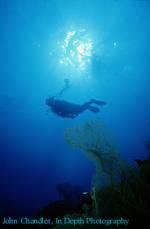 Wall diving is without a doubt one of the premier attractions for divers here on Okinawa. Good buoyancy control is the key and with it you will be rewarded with a real "inner-space" voyage. I sure hope that you will wait for perfect conditions and not push it, but when they arrive, and they soon will, be prepared to go over the edge. 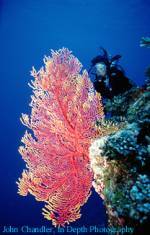 Lots of exciting things are happening on Okinawa for divers. Please be sure to always be safe and be prepared. Don't forget to check out www.h2okinawa.com for the latest weather reports and the weekly DiveCast information that helps you plan your next wall dive adventure. See you at the beach. I am the bald guy who is usually already over the edge.